I used to think (when I was a much younger writer) that all of the really great writers wrote fearlessly. I used to believe that all of the work that the great novelists produced was flawless and perfect from their start until the finished product when it landed on the bookshelves. It never would have dawned on me that writers like Steven King, Terry McMillan, James Patterson, or Sue Grafton just produced excellent first drafts and that they felt no fear at all on whether or not they would be able to get their work published. Of course now I realize that even the greatest writers were once amateurs or first time novelists once upon a time and that someone had told them no too. It’s easy to think that you are the only one that is afraid of doing what you love but the fact is that you are not. Fear strikes us all, true enough in different ways, but we are all hit with it from time to time, some more than others. I seem to be one of those people that is paralyzed by it more so than others but I am working on that. I thought of some strategies that I have learned over the years and a couple that I am still trying to put into practice that help me to work on facing those fears instead of burying my head in the sand. Face the Fear You Feel Head On— The usual response to something that you are afraid of is to run from it as fast and as far away as you can. You can’t to rely on the comfort zone that you have set up for yourself, that place where you know every answer is going to be yes and everyone is going to like whatever it is you do. Where’s the fun in that, or the challenge for that matter. Comfort may be good for a short period of time but it becomes mundane and frankly boring. Do the things that scare you because they are the things that will bring the most rewards. Let the Rejection That You Fear Fuel Your Drive— Okay it is a given (unless you are the world’s most perfect writer) that you will indeed receive rejection letters in your career. Instead of shying away from doing things that will get you a rejection letter, do them anyway and celebrate the fact that someone actually took the time to write you that rejection letter because while what you’ve submitted may not have been right for them at the time they saw something in your work that resulted in them sending you a letter. When you think about it, they could have just tossed your work and not sent you anything. For every one rejection letter you get, send out ten more query letters. Let those rejection letters do more than just pile up on the corner of your desk. Know That If You Weren’t Afraid, It Wouldn’t Be Worth It— If you weren’t passionate about your work and it didn’t mean so much to you then you wouldn’t be so afraid of failing at it. Things that mean something to us, things that we know we are good at and that we are supposed to be doing, they’re scary. God forbid you fail at the one thing that you feel deep in your soul you are supposed to be doing with your life. What then? 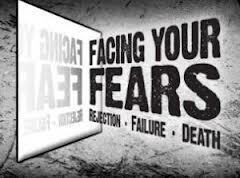 The thing is that you can’t let that fear paralyze you into just not moving forward. Take that fear as a sign that you are, in fact, walking the right path. Reflect and Refresh—When you are feeling like your work isn’t good enough, take out all of your old work. Look at all of the things you’ve written over the years and how much your writing has grown. Every now and then I do this and I find myself saying “wow, I wrote that” or even “I’ve gotten so much better”. Sometimes when you reflect on your works of the past you have no choice but to acknowledge how much you’ve grown in your work and it motivates you. It propels you forward with that knowledge of knowing your potential to produce greatness. Just Sit Down and Do It—Fear, or writer’s block as it is most often referred to (okay sometimes it really is writer’s block but not most of the time) has a knack for stopping you from producing anything. Sooner or later you get so scared that you will be rejected that you end up just not writing. This is not going to help you. Fear or no fear, just sit down in that chair, open up that computer, and start writing. Even if you think that it’s bad writing, it’s still writing nonetheless. Write anyway! Maybe one or more of these ideas will help you tackle that fear that keeps holding you back. I know that it is something that I am still working on to this day but I really think that these strategies will be a step in the right direction. If you have any strategies for overcoming your fears as a writer please share them with me. It never hurts to have enough ammunition to battle the fear with!